ISLAMABAD (92 News) – The Indian government has on Thursday imposed strict restrictions in Indian-held Kashmir’s Srinagar to foil the Muharram processions and detained dozens of mourners after they tried to take out procession in different parts of the city. 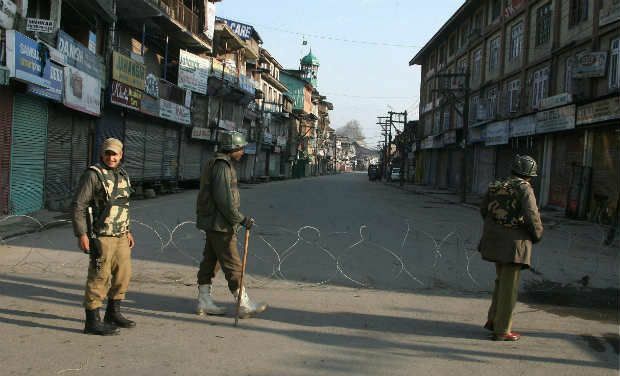 Tension was prevalent in various parts of south Kashmir for the fourth consecutive day today. Huge deployments of security personnel manned the Srinagar-Jammu National Highway and imposed strict curfew on the highway towns of Anantnag and Bijbehara. The death of Zahid Rasool Bhat, a trucker from south Kashmir’s Botengo village who was attacked with a petrol bomb in Udhampur on October 9, has sparked a wave of protests in the valley. The attack came amidst the beef ban controversy. Bhat died in a Delhi hospital on October 18. The police also detained Syed Ali Geelani on Thursday morning when he tried to visit the victim family in south Kashmir. JKLF chief Yasin Malik has already been taken into preventive custody and Hurriyat chairman Mirwaiz Umar Farooq is placed under house arrest. In Srinagar, the life came to a standstill in the commercial hub Lal Chowk as the police set up concertina wires to block all main roads. The move came as the Shia community was planning to carry out a Muharram procession from the city centre’s Barbarshah area.